On the 6th of November, our Presidium meeting took place in the premises of our Finnish partner organisation Kansallinen senioriliitto ry. During this meeting the report of the President and the general secretariat, the ESU memorandum for the European elections, and the preparation of the EPP Congress was discussed. An extensive report of these developments will be/ is distributed. Mrs. Taina, the President of Kansallinen senioriliitto ry, and Mr. Niiranen, executive director, presented their organisation to our members in a passionate way. We also had the honour to welcome Spitzenkandidat Mr. Manfred Weber to our meeting where he presented his ideas on the future of Europe and the role for seniors. After this introduction, we were welcomed by our Finnish partners for an exquisite diner where the other Spitzenkandidat Mr. Alexander Stubb shared his thoughts with our Presidium and Finnish partners. Both organizations felt that digitalization is an increasingly important issue that seniors have to deal with. We therefore wanted to focus on the different aspects of the digital developments which have an impact on the day-to-day life of older adults. This joint initiative shows the importance of active engagement of seniors on a wide array of topics. These efforts of our senior organisations also give the opportunity to seniors from all over Europe to participate in the EPP Congress in a fruitful manner. We thank our Finnish partner, Kansallinen senioriliitto ry, for the swift cooperation and the warm welcome in Helsinki. As a member association of the EPP, the European Seniors’ Union is an active partner in the decisions of the EPP Congress. The president and a delegation of 6 representatives have voting rights. 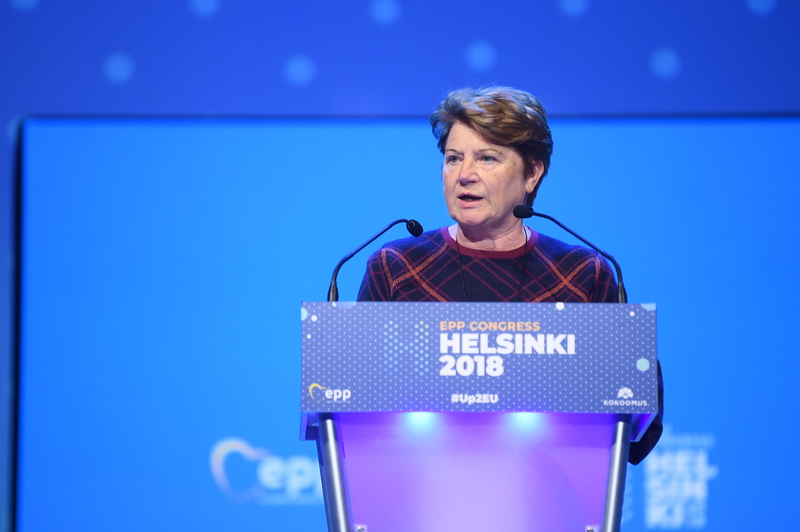 On the agenda in this Congress: the political options in view of today’s political challenges and, the most exciting moment was of course the election of a ‘Spitzenkandidat’ (see also: https://helsinki2018.epp.eu). Our representatives in different Working Groups were actively engaged in the preparation of the different Resolutions and Policy Papers that were up for vote in the Congress. They assured that the interests of seniors were taken into account during the process of adopting these policy-related documents. The Congress was an unique opportunity to voice seniors’ expectations concerning European politics. After the side-event on Digital Europe, the ESU co-hosted an event with EUCDW and YEPP on ‘a New Social Contract for Europe’ with a keynote speech by Commissioner Marianne Thyssen. Our Vice-President Lidmila Nemcova was invited to be part of the panel due to her expertise on social affairs and the elderly, particularly in Eastern Europe. This debate showed the importance of a social policy taking all citizens on board, with special regard to the elderly. The system of Spitzenkandidaten was introduced in 2014. Every European political family has the opportunity to put forward one candidate as Spitzenkandidat who can become the new President of the European Commission after the European elections. The largest group within the European Parliament after the elections, will elect its Spitzenkandidat for the new Commission President. This system was created to enhance the democratic proximity with the citizens as they would know for which President they voted. Also internally within every political group there could be an election in order to choose its candidate. In the EPP’s case, there were two candidates in 2014: Mr. Jean-Claude Juncker and Mr. Michael Barnier. The internal elections were won by Mr. Juncker, while the subsequent elections were also won by the EPP leading to his nomination as President of the European Commission. With regard to the upcoming 2019 European Elections, they were again two candidates within the EPP: Mr. Manfred Weber and Mr. Alexander Stubb. Both candidates welcomed our invitation to share their ideas and presented themselves in front of our Presidium.